Twenty-seven-year-old Otilia gets by on less than the $100 dollars each month, the amount she earns through occasional work as a seamstress. It is just enough to feed herself and her daughter, Luz Elena, who she is raising on her own since she separated from Luz Elena’s father several years ago due to his heavy drinking and abuse. He now lives abroad, and does not contribute toward his daughter’s upbringing. Otilia and Luz Elena share a mud-walled, two-room home with Otilia’s parents in the city of El Alto, Bolivia. 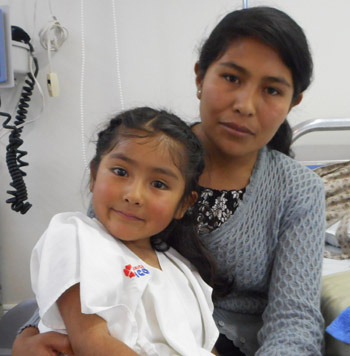 When a bothersome abscess formed and refused to heal on the kindergartener’s face, Otilia scrounged together the coins she needed to pay the bus fare and minimal consult fee to see a doctor at the Children’s Hospital in La Paz. But the result of that consultation was the last thing Otilia expected. Upon further evaluation, specialists at the hospital concluded that Luz Elena had an underlying heart condition. Otilia consulted a private clinic in La Paz that offered corrective surgery, but the cost was far beyond her reach. Fortunately, she persisted in her search and was eventually referred to benefit from the surgical campaign for children like Luz Elena, held in March 2017 at the Incor Clinic in Santa Cruz. Otilia stayed at her daughter’s bedside in Santa Cruz until they could return home. She is glad she persisted in her search to save her precious daughter, and grateful for those who made it possible: I give thanks to God that foundations exist to help people like us who have children with this problem.